Manager Robbie Neilson wants MK Dons to replicate what Sheffield United have done this season by battling for the League 1 title next year. The Blades secured promotion after six years in the third tier, spending big to win the title with three games to go. After Dons' indifferent season, Neilson is already plotting to mount a challenge for promotion next time out, and hopes he can take element's of Chris Wilder's approach to put his side into the mix. "It's amazing a club of that stature, size and with the resources they've got that they've been down here for so long," he said. "But they've managed to get out, and hopefully we can do it next year. "The big thing about them is their quality in the striking department. They've also got a defence that doesn't give up a lot of goals and a midfield that is very mobile. "It's the perfect match for League 1: you need to be able to defend set plays, have a mobile midfield and put the ball in the net. They've put together a very good squad and it has been key for them." A bumper crowd is expected for the final home game of the season when United on Saturday. While they can do no more this season, the Blades be looking to put on a show for the 7,500 fans travelling down the M1 to Stadium MK on Saturday. But the fans shouldn’t expect many goals. In the last 10 encounters, there have been just 15 goals, with six of them ending 1-0. In a rare goal-filled encounter earlier this season, Richie Barker took charge of Dons for the first time since Karl Robinson’s departure. Stefan Scougall opened the scoring at Bramall Lane after just five minutes before former Sheffield Wednesday man Darren Potter levelled four minutes into the second half. Billy Sharp secured the win for United though, netting just after the hour. This time around though, there could be a familiar face to Dons fans among the United ranks in the form of Samir Carruthers. 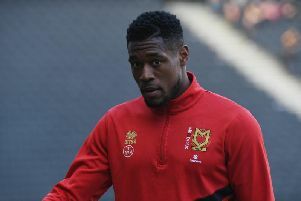 The midfielder left Stadium MK in January destined for Bramall Lane, but Neilson expects a good reception for the 24-year-old on his return to his former club. Neilson said: "He was very well liked here by the fans, players and staff here. I only worked with him for six weeks or so, but he had a really good attitude, he's a good quality player, and I'm sure he'll be desperate to come back here and play well."